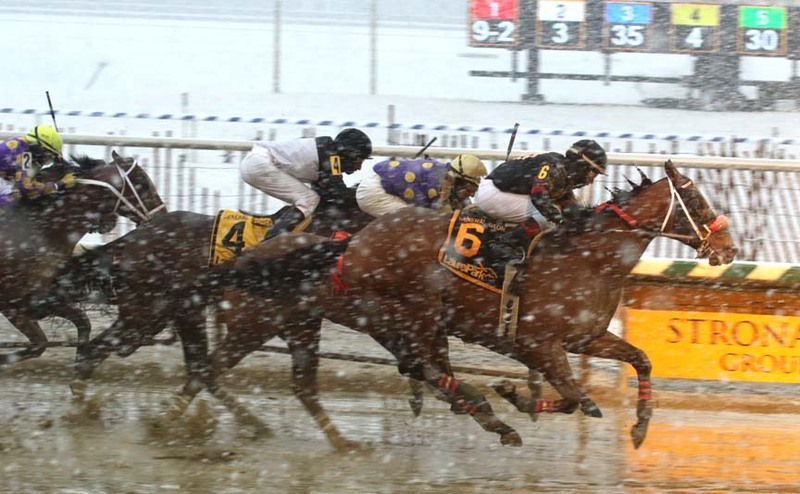 Stat of the day: Jockey Trevor McCarthy won five times on Friday at Laurel; no other rider has won more than three in a single day locally thus far in 2019. The first, a $16,000 maiden claimer, features a couple of runners making class drops. #6 Pep Talking (2-1), for trainer Graham Motion, drops out of maiden special weight company for his first start in six months after swerving out and losing his jockey late in his prior start. And #7 Lucid Dream (9-5) makes his first start for trainer Linda Rice after she claimed him in late January for $30,000. But we’ve got questions about both of these moves, and those questions point us to #4 Sweet Brother (9-2). The Lacey Gaudet trainee ran OK in his debut against similar, and while his follow-up was nothing to crow about, the added ground, easier company, and perhaps faster racetrack all could help him take a step forward today — and note that Gaudet and jockey Victor Carrasco have a 35 percent strike rate together. In this pretty evenly matched group of $25,000 claimers, there’s not a ton of early zip, which might play to the advantage of #3 Wild Rider (2-1). The Bill Komlo trainee has competed at this level, and while his last was poor, he’s been off for most of two months since and shows three works in the interim. Hot-riding bug boy Julio Correa will do the honors. But you can make a case for several of these, so this would not be the race to skimp on. Trainer Jose Corrales is trying several things to get #3 Shall Try (7-2) going: adding blinkers, cutting back from a mile to six furlongs, and, most importantly, dropping this runner to the level at which she’s been competitive previously. That should be enough in a race in which four of the six runners have made at least 28 starts with but a single win. The other more lightly raced sort here is #5 Perfect Exchange (4-1). The Rodney Jenkins trainee ran third against similar last out but has had terrible issues getting out of the gate in good order. If Jenkins has those fixed, she can win here. In her debut, #2 Never Enough Time (2-1) sped to the early lead and drew away to win easily in a race from which the runner-up returned to graduate next out. That was a flashy way to start a career, and with added ground on offer here, the daughter of Munnings figures to find herself right back at the front early, and she figures to be tough to run down. Other notables include #4 Knock Out Kid (8-1), whose last was just OK but who has won at this level before; #6 Marvelous Martina (9-5), who just missed against similar last out and gets blinkers on today; and #5 Scatrattleandroll (9-2), who didn’t run badly last out at the Fair Grounds in a race whose winner returned to win a state-bred stake. The presence of a pair of speed horses in this six-furlong test in the form of #4 Thaddeus (4-1) and #8 Took Over (2-1) might give the advantage to a horse who can relax and then run past. That pushes us in the direction of #3 El Grillo (5-1), who offers some value on the slight drop-down from open nickel claiming to beaten nickels here, and the favorite, #7 Rockin Cowboy (9-5), who’s taking a more precipitous drop. The favorite in this test is #1 Dr Bolt (9-5), who broke a lengthy losing streak last out when closing to win easily against lesser at 4-5 odds. He might come right back to win, but taking favoritism on him to do it feels a little foolish to us. Better to look for value, and one horse we think might offer some is #7 Humbolt Street (5-1). The Dale Capuano trainee is reunited here with pilot Jevian Toledo, a pairing that has produced consecutive wins (prior to his last, when he finished third with Samuel Cardona up). He cuts back here to a six-furlong distance at which he owns six wins to date, and we’re not too concerned with that just OK effort last out; that was an oddly run race with a runaway early leader, and we expect this one to be closer up today. The Tim Keefe trainee #2 One Two Three Go (8-5) has run two good races against $40,000 maiden claimers, interspersed with a pair of middling tries against maiden allowance foes. Now dropped in for $25,000, the Hunters Bay filly should be sitting on go and ready to graduate. Two others of note in here are the Claudio Gonzalez-trained #4 Talker (4-1), who led a long way on debut before settling for second; and #6 Go Amanda (4-1), who was shuffled out of contention early on last out against similar before rallying willingly into third. Breaking from the outside she can find a cleaner trip here, and if she does, she can make noise. We’re gonna keep picking against #3 Swirrlie Shirlie (7-5) until we’re broke, which may come sooner than later. The speedster has been dominating horses like these in recent starts, winning twice against $12,500 claimers and just missing for $25,000. But that makes you wonder: why is she now in for $8,000? If she wins, she wins, and you need to have her on your ticket, but we’re not inclined to take very short odds on that prospect. Better to go down fighting with a horse like #6 Yours to Keep (4-1) on top; the Jerry Robb trainee cruised against similar two back and rallied into second behind Swirrlie Shirlie last out. Xavier Perez picks this one over Robb’s other horse, #5 Weekends for Work (8-1), whom he also rode last out.